Kenyan David Rudisha was on top of the world just last week, as he broke Wilson Kipketer’s long standing 800m record with a new mark of 1:41.09. 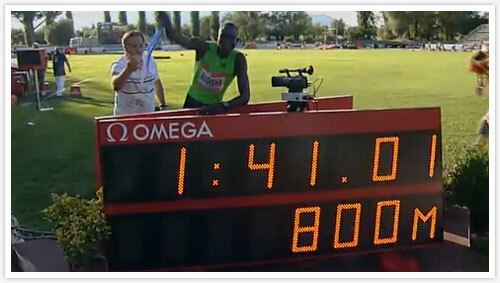 And just yesterday he once again lowered the record to 1:41.01, in a meet in Reiti, Italy. With time on his side, it won’t be a surprise if the 800m timing is again lowered by the 21-year-old, hopefully a sub 1:41.
Credit: YouTube user kobol8 and IAAF for the results.